Brief Synopsis – A look at what the 12 astronauts experienced while on the moon in order to give us an idea of what it would be like for us to be explorer of the vast gray satellite orbiting our planet. My Take on it – Being a huge fan of the US Space Program, I was amazed to find this film because it tries (and vastly succeeds) to give us the perspective of a place that only 12 men had the honor to explore. This film was originally shot in IMAX, so I can only imagine how amazing an experience that must have been, but even watching it on a smaller screen still evokes enough of an amazing journey. I loved the way that we really couldn’t tell what footage was real and which were special effects because they all truly give us the feeling that we are right there, exploring the vastness of the Moon. The way the two are merged is amazing. 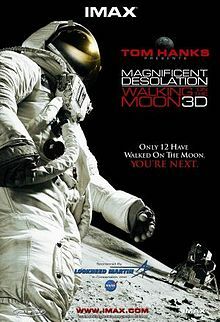 This is yet another space adventure that is helmed by Tom Hanks and his crew and once again, just like in Apollo 13 (1995) and in From the Earth to The Moon (1998), we are put in a situation where we continue to yearn for continued space exploration on the moon and beyond. An added touch was choosing some great actors as the voice cast who were able to spew actual quotes from the original 12 men giving it an even more familiar feeling the whole way through. Bottom Line – Great way to show us what the astronauts experienced and at the same time make us yearn to return to exploring the Moon. This is probably even more amazing to watch in IMAX, but it’s still a spectacularly shot film that incorporates so much of the real images with special effects. Once again Hanks and co are able to show us how much we are missing now that they stopped traveling to the moon. Loved the voice cast chosen to spew quotes from the real astronauts. Highly Recommended!